During the summer, when everyone else is focused on beach-house decor, I continue to turn my attention to warm, cozy rooms that scream winter. It's not that I want to be in such rooms when it's 90-degrees outside. A wool sofa just isn't all that inviting during a sultry, Southern summer. I do, however, enjoy looking at these comforting rooms during the summer months because it allows me to pretend that it's fall and winter. Perhaps it's my way of beating the heat. Some of you might feel as I do about summertime perusal of wintertime rooms, while others might find it stifling. But I think I have found a home that might suit all temperatures, not to mention most temperaments. 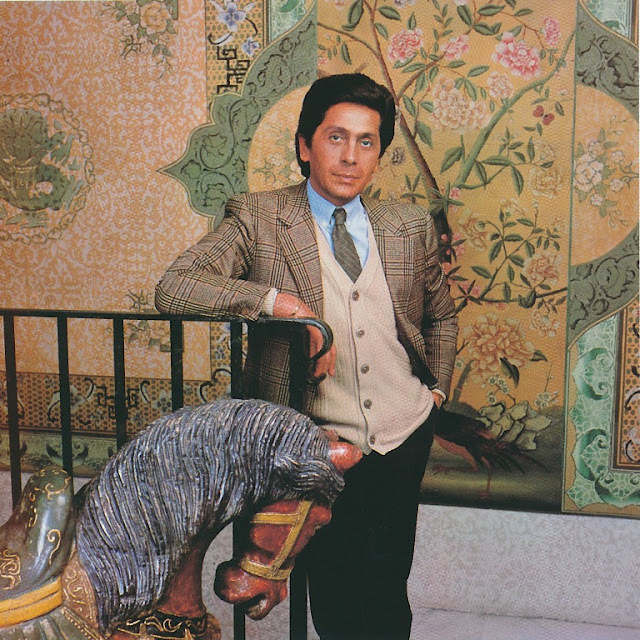 The photos you see here show designer Valentino's Roman villa as it appeared in 1981. It's an eclectic house in that some of the rooms are cool and even breezy, while others feel more like a cashmere robe on a cold winter's night. Take, for example, the home's living room, which was inspired by ancient Egypt. Decorated by Renzo Mongiardino, the room was perched on a slab of presumably cool-to-the-touch marble. Stone tables and sculptures further added to the heat-quelling atmosphere, as did the mostly neutral-colored upholstery. The only decoration that really seemed to give off warmth was the pair of fur rugs. 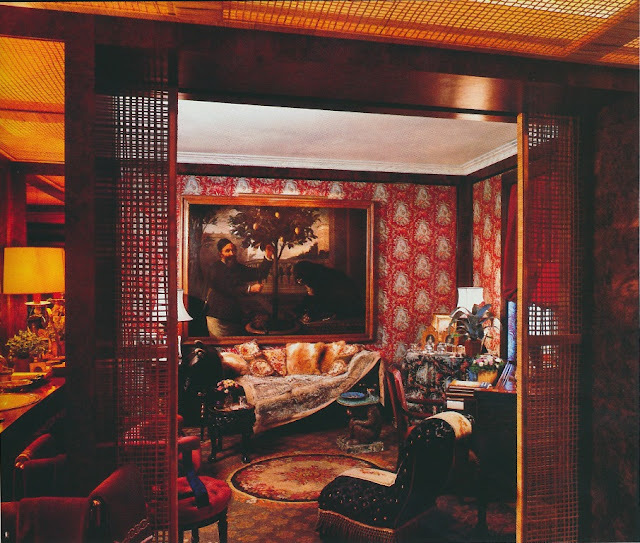 Now look at Valentino's private rooms (also shown below), which were decorated by Adrian Magistretti. The tone was maximal and the attitude Victorian. Shades of claret, russet, and Bordeaux mixed with heavier fabrics, such as velvets and tapestries. Yes, the look is slightly heavy (and reminiscent of a Denning and Fourcade interior), but it certainly keeps one's eyes entertained. 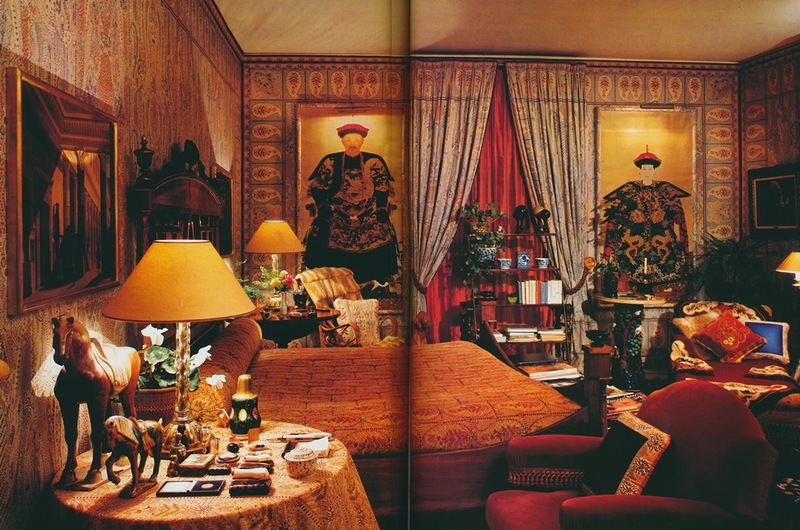 If any room could ward off a chill, it has to be Valentino's bedroom. 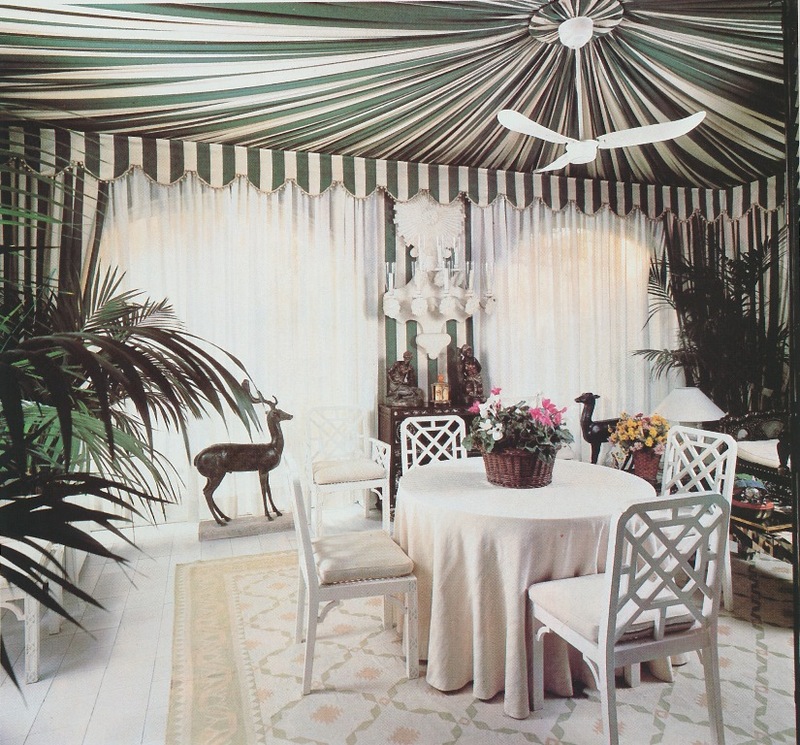 And then, switching gears again, there was the small, tented dining room, which was decorated by Valentino himself. The mood here- very spring and summery- was appropriate for the dining room's location off of the garden. It was slightly casual, a little carefree, and most intriguing when you compare it to the rest of the house. It almost feels like a dining pavilion plunked down in the middle of a garden. Of course, Valentino is known for being a polyglot collector, so it's not surprising that his house would reflect his myriad interests. What is somewhat surprising, but also very compelling, is how one house could capture so many moods- and evoke all four seasons. 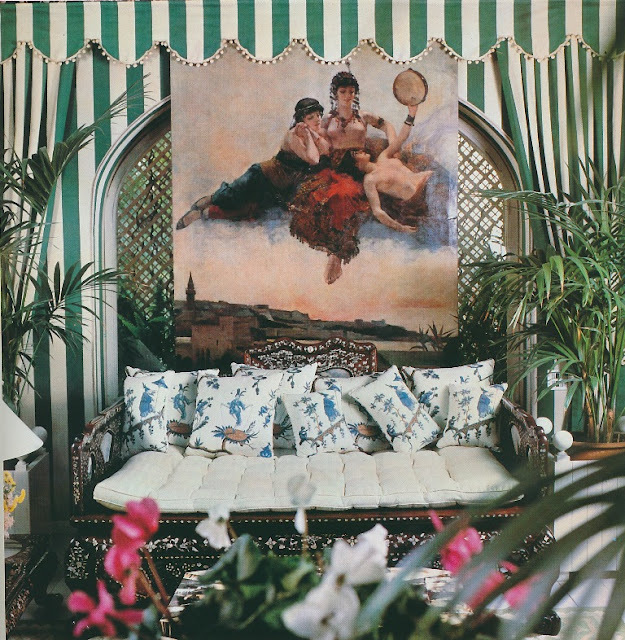 The living room, seen in the two photos above, was decorated by Mongiardino. The Salon, which was decorated by Adrian Magistretti, was Victorian in style. According to the magazine article from which these photos came, Valentino had a fondness for Victorian decor because "it's warm and inviting." 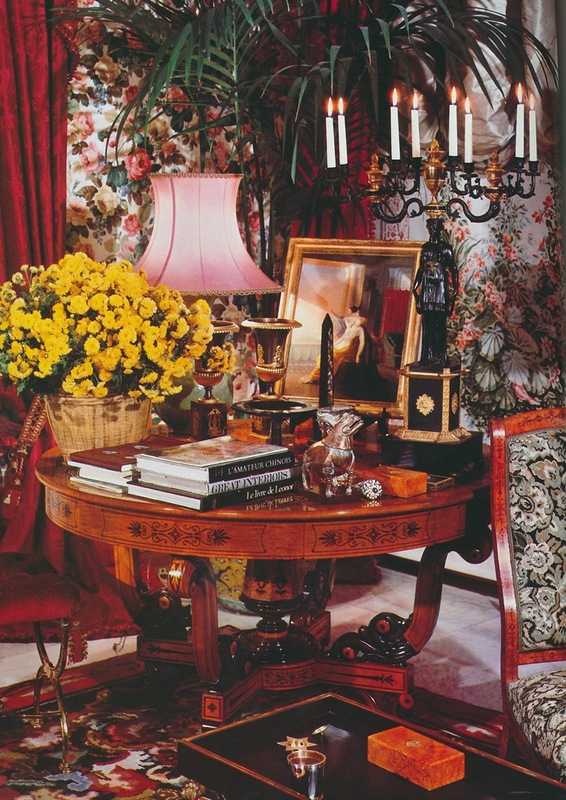 Valentino's bedroom, also decorated by Magistretti, who was responsible for Valentino's sitting room, below. 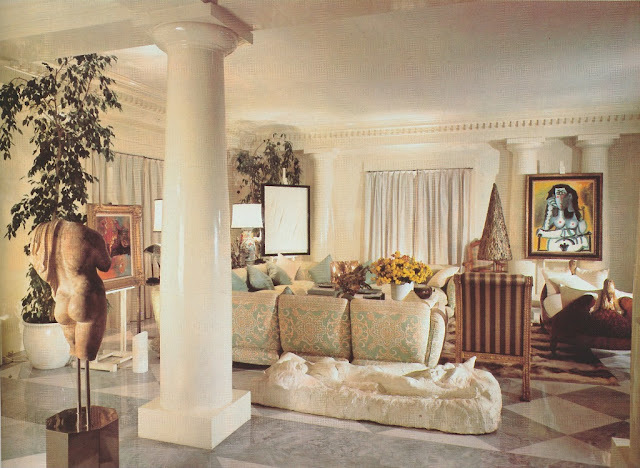 The sitting room was located off of the master bath. Two views of the small dining room. The Chinese bed is ebony with mother-of-pearl inlay. 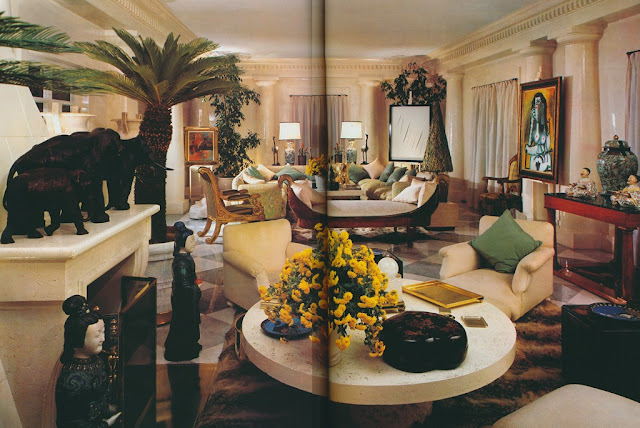 All photos from Architectural Digest, August 1981, Robert Emmett Bright photographer. Thrilling rooms for Valentino designed by the very best (even himself). I adore the living room; however anything that Mongiardino created works beautifully, timelessly for me! Every one of these rooms is gorgeous, warm and inviting. What is most wonderful, it's as if each space tells its own story. Mongiardino is a master of the mix! Loving the color scheme used for the living room. Absolutely fabulous! Surprised there isn't an office room or study room in there. The decor really strikes me as something a scholar would have in his home. I'd personally love to sit underneath a painting with gravitas and get some heavy reading and noting down done. How thrilling to know that I´m not alone in the world regarding the great pleasure that I take from browsing warm rooms during the summer! It really is a turn off all those pool magazine covers during the summer!